Club Penguin: How to Become a Black-Belt Ninja Cheats and Guide! There are many penguins battling to become a ninja. Becoming a ninja unlocks you some sweet items like a cool mask or even a special items that lets you become invisible. There are no codes to turn your penguin into a ninja. Take a look at the guide on how to become a ninja. 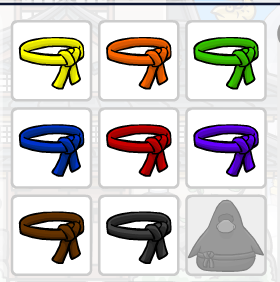 Many penguins who became a black-belt ninja also wanted to know how to become a Fire Ninja on Club Penguin. To become a ninja you must battle against other penguins to earn your black belt. Each time you win you'll get closer to recieving your next belt. You can check your progress by clicking the cards on the bottom right corner of your screen. Every penguin starts off with a normal deck. To beat other penguins you have to send the opposite of their card. If a penguin sends out SNOW you have to send out FIRE because fire beats snow. Getting to a black belt won't be easy because there are 9 other differen't belts you must earn first. If you try your best you'll get to black belt in no time! 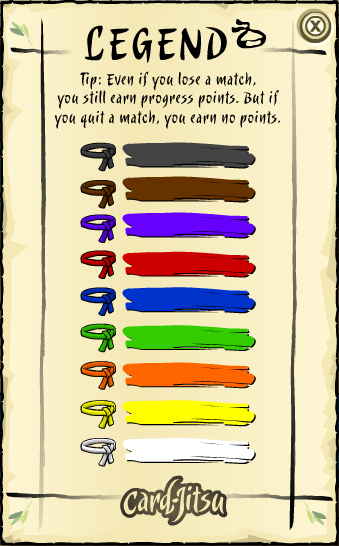 NOTE: The fastest way to earn belts is by talking to sensei and clicking "Earn your belts"
Once you are a black belt you have to fight against Sensei. Once you beat him, he will give you your well earned black belt and let you keep it! NOTE: You will not beat Sensei on the first try. It takes several tries until you beat him. You can also buy a lot of cool ninja stuff from the Martial Artworks catalog. Just go to the dojo and click the red book at the bottom right of your screen. That's it! Now you have become an official Ninja on Club Penguin! Guides for how to become a Water and Fire Ninja will be coming soon so keep checking back! Good luck!